All patients over 20 years are recommended to be screened annually as part of their dental check up. We are very proud to be the first dental practice in Ireland to have the Oral ID. This fluorescent technology helps the dentist to identify Oral Cancer, Pre-Cancer and other abnormal lesions at an early stage, thus saving lives. Oral Cancers have increased over a 6 year period, where all other cancers have declined. 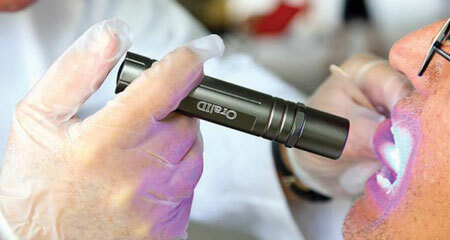 Oral Cancer is on the rise and striking younger. Since December, we have had one 28 year old non-smoking male in our practice diagnosed using this technology. As the cancer was detected early, the patient was able to get access to treatment. My colleagues have also reported 23, 26 and 29 year old females who were also diagnosed with the technology, two of which who were in the advanced stages and were unable to avail of treatment in time. This is not something we ever want to see at Haly Dental Care and early detection is crucial. This technology is vital to our patients’ health and wellbeing and we are adamant that every patient of Haly Dental Care avail of this life-saving treatment. Education and screening is our philosophy at Haly Dental Care.